Turn Off, Tune Out and Drop Off The Grid in California. 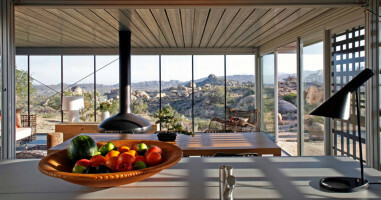 Far out in the sun-baked wilderness of the California high desert, nestled amongst ancient rock formations and towering cacti; drop off the grid in a self-sufficient retreat where no social media has ever been before. Far out indeed, man. So what, the Off-Grid itHouse is a property in the middle of nowhere? Whoa, hold your horse's cowboy, we’re talking ‘less is more’ incarnate. Let's say the Off-grid itHouse ‘a concept in the middle of time and space’, to put a little existential accent on things. This Air B&B Top 10 is a mean feat of functional industrial design meets an ultra conscientious environmental endeavour. 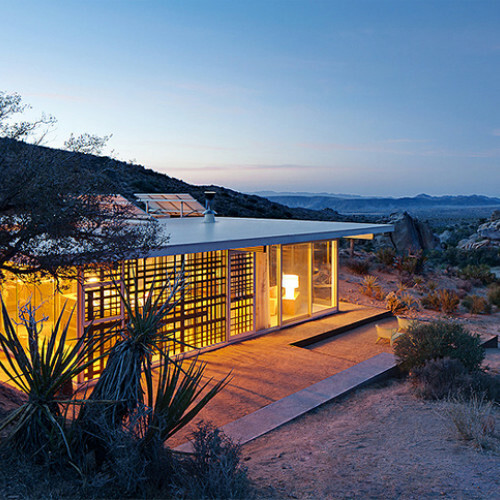 The itHouse has received acclaim from the whole spectrum of architectural and environmental authorities as well as guests who agree unanimously that to experience solar powered solace in the desert from this glass walled haven draws life’s priorities into stark focus. The itHouse is a prototype but the brains behind it seemed to have got things right first time because the whole world has stood up and taken notice. Join the catalogue of writers fleeing distractions, wildlife photographers, eco aficionados, architecture boffins and curious travellers who have dropped off the grid and found a stint in one of the most naturally beautiful corners of the world a deeply rewarding decision. Being mesmerised by light and shadow inside the house, separated from the desert at night only by glass walls and roaming the surrounding landscape at sunrise, sipping coffee as nocturnal animals disappear into burrows. Doesn’t that sound a lot like Living? 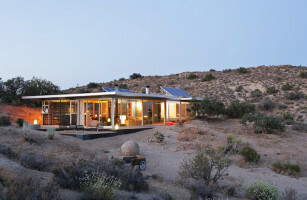 Off the grid eco house in the California high desert. Arrive in the valley with plenty of daylight left to avoid searching in darkness for the house! A chance to live simply and serenely with the comfort of modern architecture.